The privacy of your personal data is one of the main concerns of Sanco Grup srl, based in Nerva Traian Street, no. 15, Bl. M69, Ap. 50, Sector 3, Bucharest, Romania, as data operator. This document is intended to inform you about the processing of your personal data in the context of the use of the https://www.sancogrup.ro/en website, which we will refer to as the "site". As well as any other categories of data you provide directly in the context of creating your user account in the context of placement of an order through the site or in any other way resulting from the use of the site. If you use your Facebook or Google account to create a user account on your site, Sanco Grup srl will process the following public profile data displayed by those applications: username, email address. If you choose to create a user account just before completing the order of a product available on your site, your email address will be required to automatically create an account. If you do not complete the order, the email address and other data provided will not be stored by Sanco Grup srl and the created account will be automatically deleted. Indirectly, data such as: IP address, browser used, browsing duration, search history, operating system used, language and pages viewed, complete URLs, sequence of clicks to, through and from our site, information or products viewed / searched, duration of visits to specific pages, information on page interaction (e.g., scrolling, clicks, mouse passages), user behavior data. to carry out the contractual relationship between you and Sanco Grup srl, respectively for picking, validating, sending and billing the order placed on the site, informing you of the order status, organizing the return of ordered products, etc. Basis: The processing of your data for this purpose is based on the agreement between you and Sanco Grup srl, as defined in the Terms and Conditions https://www.sancogrup.ro/en/terms-and-conditions. The provision of your personal data is necessary for the performance of this contract. Refusal to provide data may result in the contractual relationship between you and Sanco Grup srl. to meet the legal obligations of Sanco Grup srl in the context of the services provided through the site, including fiscal obligations as well as archiving. Basis: Processing of your data for this purpose is required on the basis of legal obligations. Providing your data for this purpose is required. Refusal to provide data may result in Sanco Grup srl being unable to comply with its legal obligations and therefore unable to provide your services through the site. 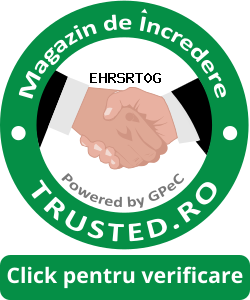 pentru activitati de marketing, respectively for transmission, by means of remote means of communication (e-mail, sms) of commercial communications on the products and services offered by Sanco Grup srl through the site. You can express your consent to data processing for this purpose by ticking the appropriate box at the time of account creation or after creating your account at the section of my account information. For unsubscribing from receiving such commercial communications, you can use the option at the end of each e-mail / sms containing commercial communications. In addition, you can unsubscribe by visiting the "My Account Information" section. Providing your data for this purpose is voluntary. Refusing to provide consent to process your data for this purpose will not have any negative consequences for you. in order to perform various analyzes, reporting on how the site works, creating consumer preference profiles, mainly to improve the experience on the site. Basis: The processing of your data for this purpose is based on the legitimate interest of Sanco Grup srl to permanently improve the customer experience on the site. Providing your data for this purpose is voluntary. Refusing to provide data for this purpose will not have negative consequences for you. for marketing activities, respectively for transmission, by means of remote means of communication (e-mail, sms) for commercial communications on the products and services offered by [the website owner] through the site. You can express your consent to data processing for this purpose by filling in and ticking the corresponding box in the newsletter subscription form available on the site. For unsubscribing from receiving such commercial communications, you can use the option at the end of each e-mail / sms containing commercial communications. to resolve complaints, complaints and to monitor traffic and improve your experience on the site. Basis: The processing of your data for this purpose is based on the legitimate interest of [the website owner] to ensure the correct functioning of the site, as well as to permanently improve the visitor experience of the site, including by solving various comments, questions or complaints. Sanco Grup srl will process your personal data as necessary to achieve the above-mentioned processing purposes. If you are a customer, we will process your data for the entire duration of the contractual relationships and subsequently to the legal obligations of Sanco Grup srl (for example, in the case of financial and accounting supporting documents for which the statutory retention term is 10 years from the end of the financial year during which they were drawn up). If you are a customer and you are exercising the user account deletion option, by clicking the "delete account" button in the "my account information" section, Sanco Grup srl will interpret this action as your option to unsubscribe from receipt of commercial communications to keep you posted on the products and services offered through the site. In this sense, if you choose to delete your user account, we will no longer send you emails and / or sms of that kind. However, we want to inform you that deleting your account will not automatically delete your personal data. If you wish your personal data not to be processed or if you wish to delete the data, you may exercise the rights detailed in paragraph 6 below. If you request to delete your account, but there is at least one active account on that account, the request for deletion of the account will only be recorded after the delivery of the products and the completion of the last active order. If you withdraw your consent to data processing for marketing purposes, Sanco Grup srl will cease processing your personal data for this purpose without affecting the processing of Sanco Grup srl on the basis of your consent prior to its withdrawal. We do not rent / sell your personal data to third parties. In addition to the operator, in certain circumstances, the data may be accessible to third parties such as service providers, carriers, hosting providers, IT companies, called if necessary as persons empowered by the Operator. They are contractually bound to maintain the confidentiality of data and use them exclusively for the purpose for which they were provided. Personal data provided to Sanco Grup srl can be transferred outside of Romania, but only to states in the European Union. - at any time, free of charge and without any justification, that the data that is intended to be processed for direct marketing purposes. right to address the National Supervisory Authority for Personal Data Processing or the competent courts, to the extent that you consider it necessary. For any additional questions about how personal data is processed and to exercise the above-mentioned rights, please email us at dpo@sancogrup.ro or phone 021.317.59.36 . Sanco Grup srl does not knowingly contact or collect information from people under the age of 16. The website does not aim to request information of any kind from people under the age of 16. If, by mistake, we are in possession of such information and we are aware of this, we will obtain the appropriate parental consent to use this information or, if that is not possible, we will delete the information from our servers. If you are under the age of 16 and receive information from us please contact us by email at dpo@sancogrup.ro or phone 021.317.59.36. We will immediately halt this information and delete the previously collected data. Re-enrollment will take place after obtaining a parental consent.